Immerse yourself in nature, and allow the fields, woods and horses to be a restorative balm – a catalyst to inspire and spark creativity, help set goals, or reboot. This is a perfect program for corporate leaders or anyone looking to practice being calm and assertive in the presence of horses, or to simply step out of a busy life and breathe in unison. Hiking and Horses brings two incredible worlds together via mindfulness, meditation & journal entries. Participants are led through a mindful meditation, centered in breath and body awareness prior to taking the horses for a hike. 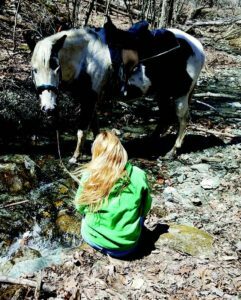 We will then hike with our equine partners through the beautiful fields and woods along a trail with a babbling brook, to a meditation sit spot. You will then be guided in a solo sitting meditation, time will be allotted for journal entries and/or free association writing, or vision board inspiration. We will then hike back to the ranch and have a moment to close the program. Practice with the healing horses as they graze nearby. A class specifically designed for the on farm experience. An all levels flow, meditation and mindfulness practice while you delight in the senses of the ranch, organic surroundings and horses around you. There will be 15 mins at the end of class for a short meditation and/or journal entry, free association writing time, or bring a sketch pad. Curriculum Created and led by Monica Celli MA Ed. of Equus Yoga, presented at Berkshire HorseWorks. Couples come in many shapes and sizes. parent/child, husband/wife, significant others, siblings, or friends. Depending upon the composition of the coupling, sessions are flexible: either focusing on the clients’ request to address a topic or as a general activity that is fun, engaging, and challenging. Whether the session is crafted around exploring intimacy, enhancing communication, processing the underpinnings of sibling rivalry, reinforcing the parent/child bond, or a creating common goals, clients leave with a greater understanding of themselves and each other. Berkshire HorseWorks experiential workshops foster self-reflection and serve to empower women by improving self-esteem, independence, confidence, decision-making and leadership skills. BHW’s highly trained team provides an environment in which women can feel safe to develop a deeper sense of self awareness, cultivate mindfulness, and find the crucial balance between assertiveness and femininity. In these sessions, you create journeys by engaging props and members of the herd which often parallel experiences in your lives. The horses help those who are “stuck” to move through transitions. The integration of EAL activities is a perfect complement to guided hikes, workshops with life coaches, vision boarding, and even campfire journaling. Pricing for both packages available upon request. Register for a BHW Event! Complete the form below to register for any of BHW events, a member of BHW staff will follow up with you right away.